Sign the Forest Glen Tunnel/Entrance Today! MoCo and SHA are reviewing the tunnel/entrance at Forest Glen. Please show your support and sign today! 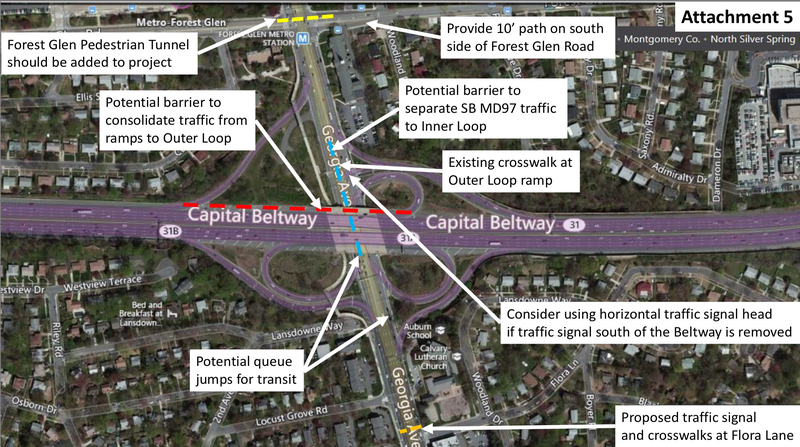 Recently the Montgomery County Planning Department of the Maryland-National Captial Park and Planning Commission (MNCPPC) recommended the inclusion of the Forest Glen Pedestrial Tunnel under MD97 (Georgia Ave.) as part of the Montgomery Hills MD-97 redevelopment project. With almost 800 pedestrian trips per day at Georgia Ave and Forest Glen Rd. and over 80,000 vehicles crossing this intersection – this area is in dire need of a safe pedestrian crossing. Despite this recommendation, this isn’t the first time the Forest Glen Pedestrian Tunnel has been discussed. In 2005, WMATA conducted a study for the proposed tunnel and determined that such a structure was feasible but would cost over $11 million to construct. At that time there was even a community push by residents and Holy Cross Hospital to bring awareness to the issue – but unfortunately nothing materialized. By 2006, WMATA began presenting the study to various entities, including the County Council, but since WMATA did not have the funds for such a project – construction never started. In 2008, a $3 million Montgomery Hills traffic study once again brought hope to residents that the tunnel project could regain life. By 2012, MCDOT also conducted a feasibility study on the tunnel and provided their recommended option, the “Tunnel Alternative 2,” shown below. Based on the study, it would take almost 3 years to construct the tunnel with 6 major phases of construction. 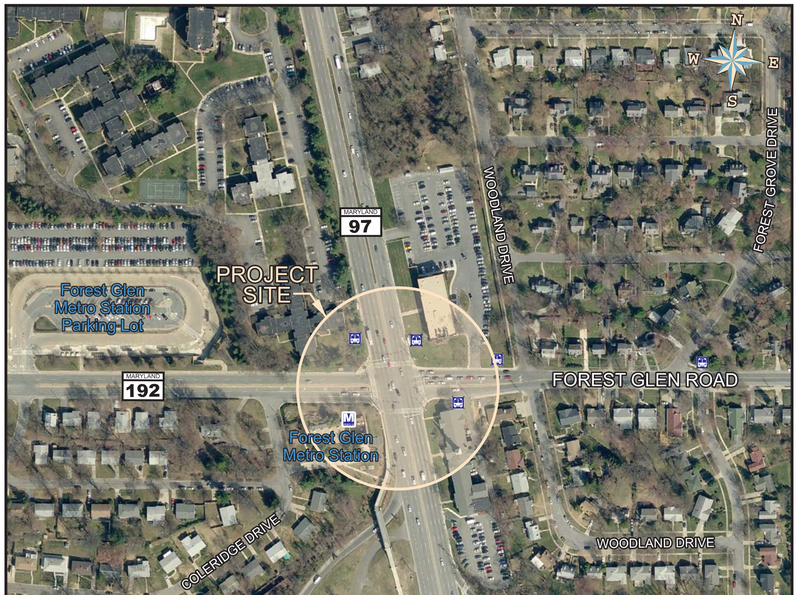 In the same study, MCDOT even contemplated a pedestrian bridge as a possible crossing to the station. According to MCDOT’s pedestrian bridge model, the structure would have both stairs and elevators (making it ADA compliant) and would be integrated into the existing staircase that goes down to the mezzanine of the station. This in theory would have allowed pedestrians to have quick access to the other side of Georgia Ave. The pedestrian bridge had significant advantages – it would take only 15 months to construct and cost only $5.8 million – almost half of the cost of the proposed tunnel. But visually the design was awkward – standing high overlooking the Montgomery Hills Baptist Church. Public feedback on the bridge option was also poor – with residents stating that they felt the stairs were too long and the overall design was too dangerous for daily use. The Montgomery County Planning Department was also not convinced that the concepts worked and determined that more work needed to be done. By this time MCDOT even applied for two U.S. Department of Transportation TIGER grants but funding was not approved. 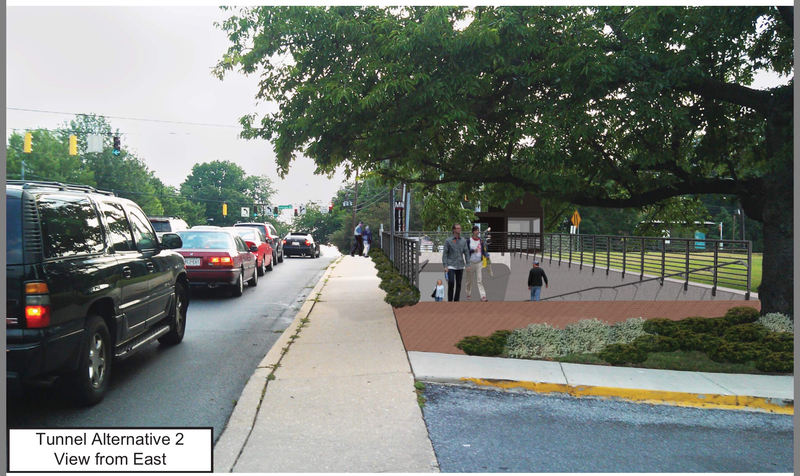 By 2013, MCDOT’s Forest Glen Passageway Study selected its preferred alternative “Tunnel Option 2” and today the project is out of the engineering phase and is ready for construction. Last year, we reported that the tunnel proposal reached Governor Hogan’s desk and was awaiting funding. 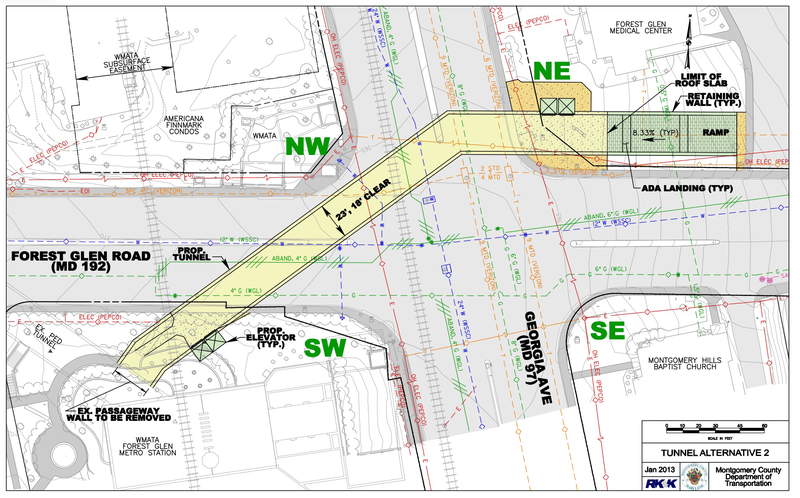 Even WMATA, when it opened Forest Glen for redevelopment proposals, included a requirement for developers to improve pedestrian access across Georgia Avenue. Fast forward to 2016, locals continue to deal with Maryland’s most congested intersection. In some cases, locals are so scared of this intersection that they often resort to driving from relatively short distances instead of walking to the neighborhood station. 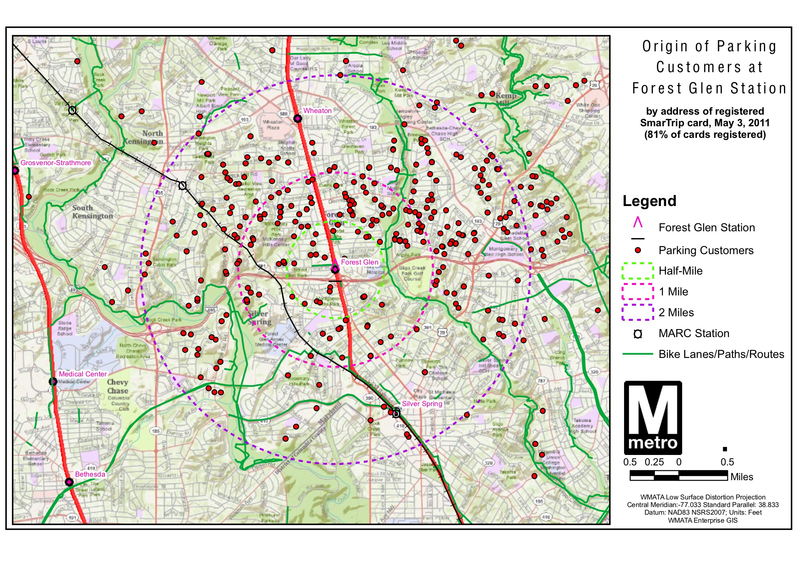 The below graphic from a WMATA study shows a rather large number of residents living within a mile of the station that are driving to the Forest Glen parking lot (based on data received from SmartTrip address records). With such challenges facing the Forest Glen area, one can only hope that Maryland and the SHA (State Highway Administration) will recognize that this project needs immediate funding. With Forest Glen redevelopment on the horizon and the Purple line close by, the pedestrian tunnel could be the final piece of the redevelopment puzzle that connects East and West Forest Glen. 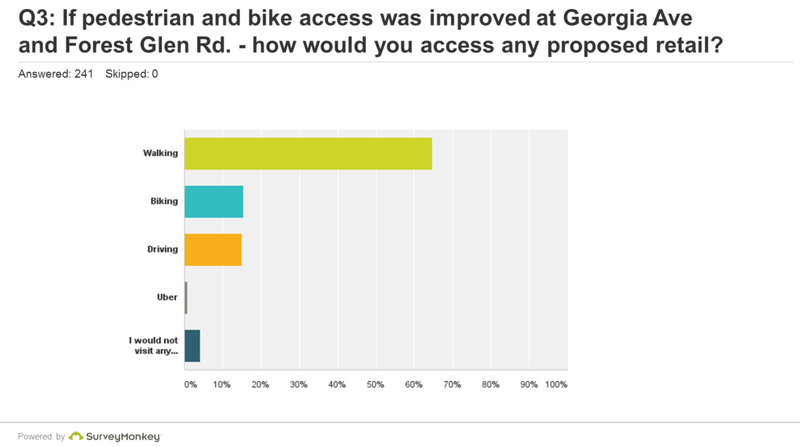 In a local survey of Forest Glen residents, 80% of respondents stated that they would walk or bike across Georgia Ave to get to the redevelopment sites if pedestrian access was improved. A pedestrian tunnel seems like the perfect conduit for a physically separated community waiting for its moment. She didn’t -because there was no tunnel. Can Forest Glen become more WALKABLE? It turns out there is a link between home values and distance to Metro (surprise!). Forest Glen’s median home value is about 447k – significantly higher than Rockville, Twinbrook and Strathmore stops. Read more about it here. Forest Glen Station Civic Association Meeting tomorrow! Learn about Forest Glen redevelopment! The downtown has a long history – early 20th century vibrancy, death by mall and a recent successful resurgence. And today, with so many projects in the pipeline, the future urban landscape of the area will almost be unrecognizable. 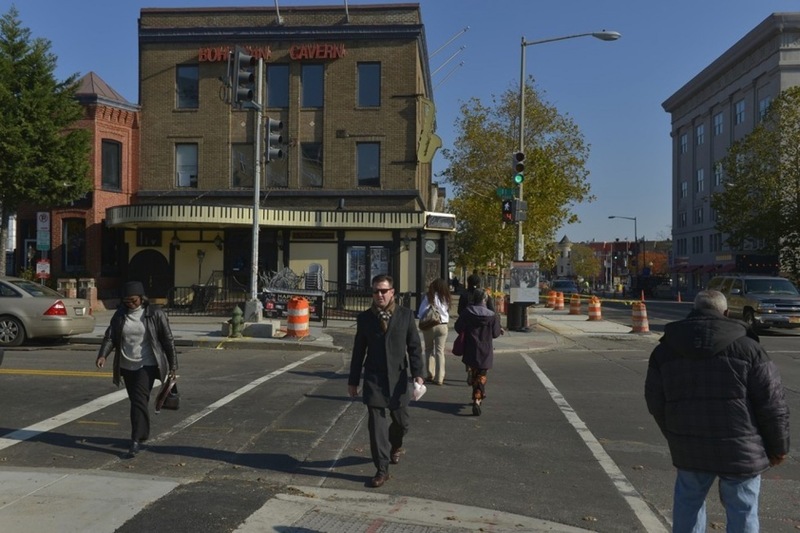 The” Brooklyn” of DC has transformed – but what about the surrounding areas? Arguably, the next chapter of Silver Spring’s future involves its close-in neighborhoods – particularly Forest Glen and Lyttonsville. The upcoming transformation of these two neighborhoods will undoubtedly change the way we look at the Silver Spring area and how we define the new “urban -suburban” mixed neighborhoods. While the Forest Glen neighborhood transitions from Silver Spring to Wheaton and Kensington, Lyttonsville straddles both downtown Silver Spring and Chevy Chase. Combined, both neighborhoods have a Red line metro stop and two future Purple Line stops, not to mention direct access to I-495, Rock Creek Park and the Georgia Ave. and 16th Street corridors. And with excellent schools, a plethora of parks, and a potential for real walk-ability – these two transitioning neighborhoods serving almost 16,000 residents will redefine the MoCo “suburb.” Over the next few weeks, FFG will be presenting a multi-part series on these two neighborhoods – their shared past and future – and how their development is critical to how Silver Spring grows and what it means for the future of suburbia. Forest Glen and Lyttonsville have a shared and distinct history. During the 18th century, large tobacco plantations were established within parts of Lyttonsville and Forest Glen. The owners, the influential Carroll family, introduced a large slave population to the area. The land known as Forest Glen today was also purchased by Daniel Carroll, whose son, Daniel Carroll II, would later become a member of the Continental Congress and a signer of the U.S. Constitution and Articles of Confederation. His other son, John Carroll, would go on to establish Georgetown University. As parts of MoCo were ceded to the District in 1792, the “North Corner Boundary Stone” was erected off today’s East-West Highway to establish the District’s boundary. When Brookville Road in Lyttonsville and Georgia Avenue in Forest Glen were built, both became very important thoroughfares for commerce and public transportation. By the 1850s, Francis Preston Blair, the founder of today’s Silver Spring, established several country estates within the Lyttonsville area. Samuel Lytton, a free black laborer in the Blair’s household, purchased a nearby four-acre plus tract, eventually becoming the center of pre-Civil War free black settlement area known as Lyttonsville. Meanwhile a quarter-mile north of Lyttonsville, Forest Glen was being redeveloped into a resort hotel after being used for almost a century to grow tobacco. Ye Forest Inne in 1887 – Photo courtesy of Save our Seminary. 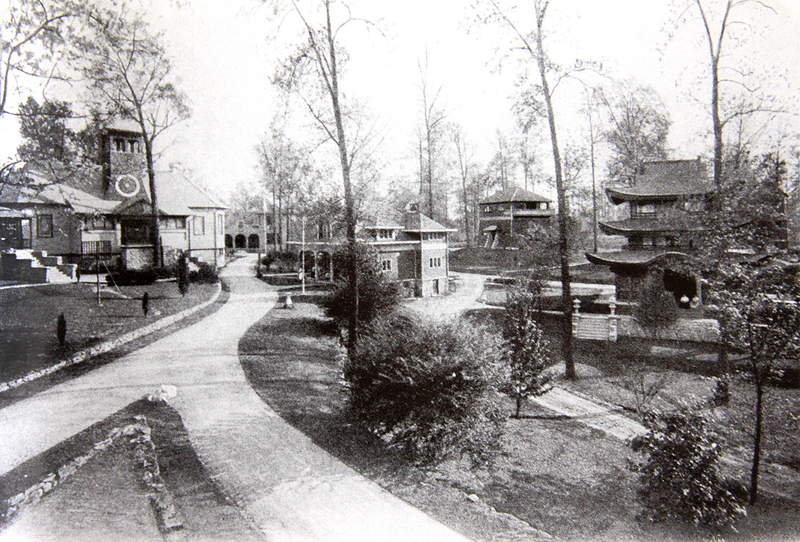 In 1894, the resort’s business model had failed and was purchased by John and Vesta Cassedy, former educators at the Norfolk College for Young Women in Virginia. 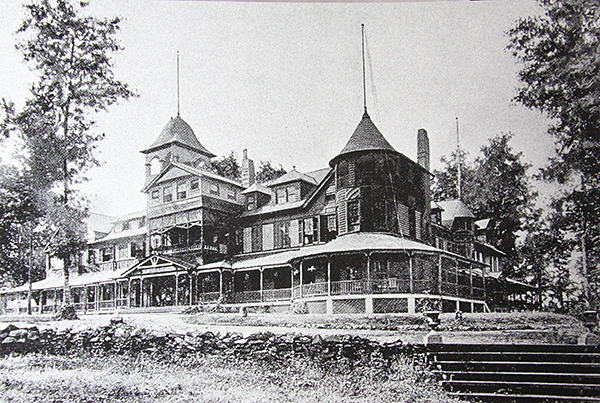 The Cassedy family turned the resort into a women’s “finishing school” called National Park Seminary. National Seminary Park campus – Photo courtesy of Save our Seminary. One of the most prestigious women-only schools in the country, the institution was an upper-class an all-white finishing school from 1894-1942. While the Seminary served an elite population in Forest Glen, the Linden School in next-door Lyttonsville served a very different demographic. Constructed in 1917 on land purchased from the same Cassedy family of Forest Glen, the school’s two-room segregated setup was starkly different than the Seminary’s grand Greek-Roman inspired buildings. The school, which had no running water or plumbing, served the African American community until Montgomery County’s schools were integrated in 1955. Until the 1960s, Lyttonsville’s general infrastructure was considered severely substandard by MoCo standards – lacking paved public roads, running water and even indoor plumbing. Lyttonsville residents and Civic Association leaders Lawrence Tyson and Gwendolyn Coffield, led an urban renewal effort from the 1960s to the 1980s to change their under-served neighborhood. This urban renewal activism eventually brought paved roads, street lighting and modern water and sewer facilities to the community. Meanwhile, in nearby Forest Glen, the 7-story Americana Finmark condo complex was being completed and nearby farm communities like the Thomas Riley Estate, became large planned single-family communities. Directly in between Lyttonsville and Forest Glen, the Forest Glen Annex began to take shape and took over parts of the National Park Seminary while expanding the Walter Reed Army Institute of Research and the Navy Medical Research Center. By the 1980s, both Forest Glen and Lyttonsville became established communities where new homes and community centers were part of a vibrant and diverse neighborhood. 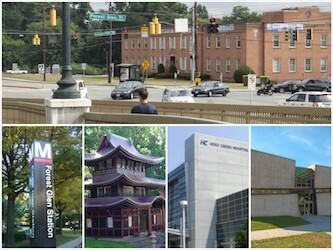 By 1978, downtown Silver Spring received its first metro station and with the expansion of the Red Line in 1990, destiny would change Forest Glen forever by establishing its very own metro station. In 1998, the Red Line was extended to Glenmont, decreasing ridership and making Forest Glen one of WMATA’s most underused stations. With the Forest Glen Metro Station being the subject of redevelopment, the station’s 8-acre parking lot and surrounding areas are currently the subject of a new sector plan review in conjunction with neighboring Montgomery Hills. Forest Glen Station’s 8-acre parking lot and future redevelopment site. By the late 1990s, the Maryland Transit Administration (MTA) began to study the need for an east to west mass transit system inside the Capitol Beltway. After many studies and political transitions, the Purple Line was funded and approved in 2015 with work expected to start in 2016 and operations beginning in 2022. Lyttonsville’s Sector Plan includes two Purple Line stops, one at Brookville Rd. and the other at 16th St and Spring St. Both sites have substantial redevelopment opportunities and are the subject of current redevelopment proposals and rezoning. 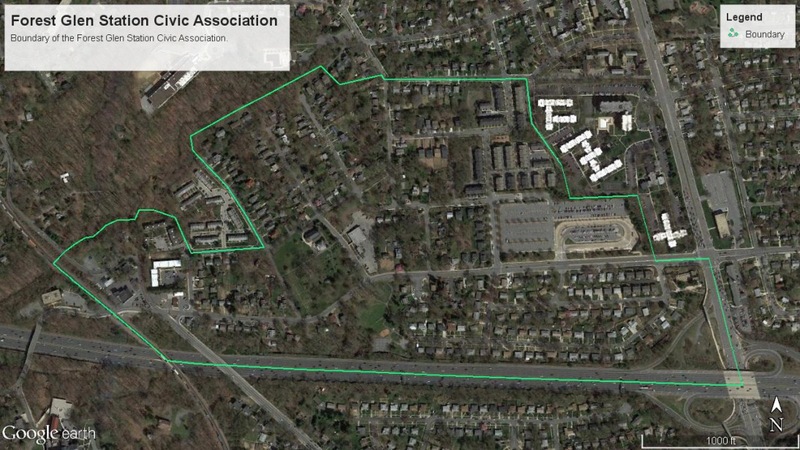 In Part 2 of this series – FFG will explore how the future of the Lyttonsville and Forest Glen are interconnected and what this inter-connectivity means for potential redevelopment and the greater Silver Spring area as whole. I’m Running for Planning Board! New Bakery opens in MH! Georgia Ave Can Be Safer! Forest Glen Clean-up this Weekend!